Kaffe Fassett changed my knitting. Back in the late 1980s I was kntting a lot, as always, but it was starting to get a little tedious. I really enjoyed knitting intarsia sweaters for my daughter but, at about age ten, she was starting to get a bit old for them. Some were okay, such as the New Kids on the Block sweaters, but others weren't "cool". I was also knitting gifts for friends who were having babies, but my friends were getting older and the baby years were pretty much over. Then, along came Kaffe Fassett with his over-the-top intarsia designs and 20+ colors. It was exciting. I also discovered Rowan yarns and loved all the colors and textures. I bought all of his books, subscribed to Rowan International, and made plans to knit many new sweaters and I did tackle a number of them. Some designs are still on my must-make list. I went on to discover other designers: (all Ravelry links) Jamie and Jessie Seaton, Kim Hargreaves, Jean Moss, Sasha Kagan and Annabel Fox, to name a few. Over the years the books slowed down as he got into quilting and mosaics, for example. I kept hoping for a new book and there were a couple, but they were mostly patterns reworked from his older designs, or his pattern library. I was pleased and hopeful when I learned that a new book was to be published recently. 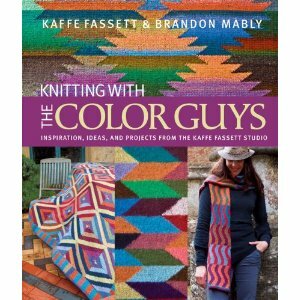 The book is "Knitting With The Color Guys" by Kaffe Fassett and his partner, Brandon Mably. I thought that, perhaps, a new book of designs was finally being published. It's a pretty book - lots of beautifully photographed knitwear and pictures to set the mood of the book. However, I'm afraid that I'm again disappointed. I've seen many of these designs in one form or another before. Also, the designs are simpler than previous works. The earlier patterns had lots of colors added in at random, building richness. If you look inside the front cover of the book you can see an example of this. Most of the patterns in this book have distinct geometric borders, all quite predictable. To me, they don't appear as intricate. I miss the fabulous sweaters and coats which have now progressed to scarves, throws and pillows. I bought this book based on the fact that it was a Kaffe Fassett book. Would I buy it again? Probably. It is enjoyable to leaf through the pages, but I'm not sure if I'll make any of the patterns. That's okay as I still have a long list of earlier designs that I want to make. I'll always remain a fan and I'm grateful that he brought excitement and passion back to my knitting. Glorious Knits is one of my favorite books, love the cover jacket and will be my first project when I do one. Have not knit any of Kaffe's patterns but hope my eyesight holds out so I may when I can manage my free time as I choose. Alice Starmore is also on my to do list.